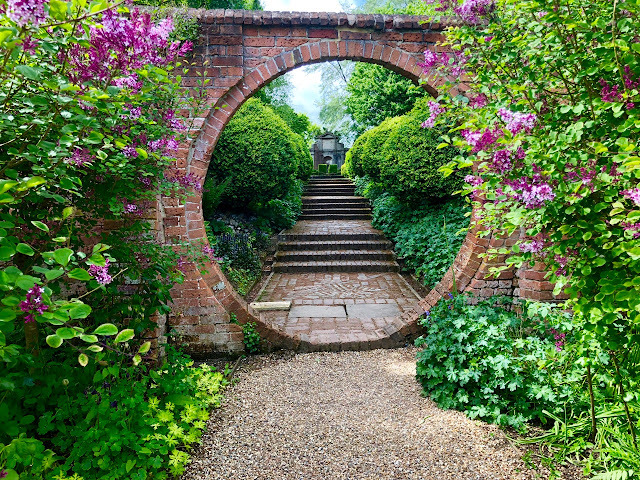 England is well known for its glorious manor houses, and when they have gardens to go with them, they provide a little piece of heaven! 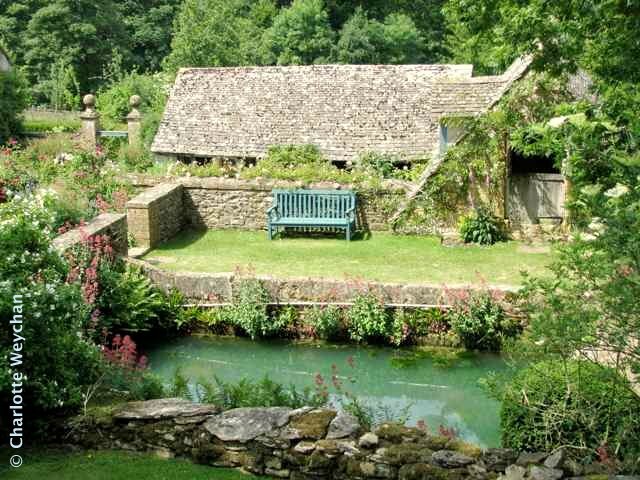 Two that I've recently visited are Snowshill in Gloucestershire and Mottistone on the Isle of Wight - both under the stewardship of the National Trust - but quite unique in their own way, because you've got the added bonus of visiting an ancient house alongside a stunning garden! 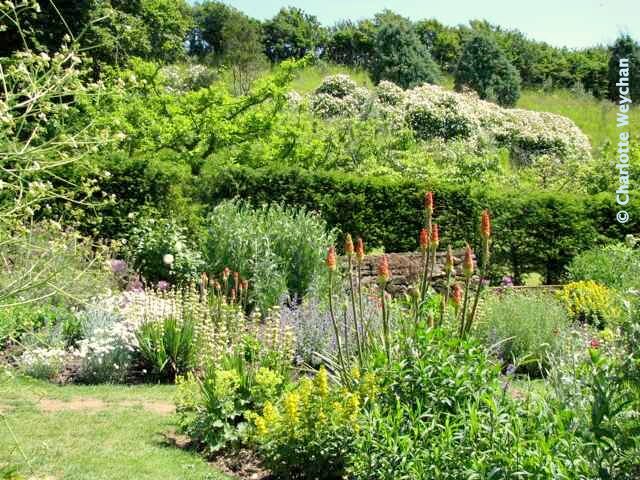 Mottistone is a lovely property, nestling in a valley on the south side of the Isle of Wight, with roses to die for and borders (below) that will lift your heart! 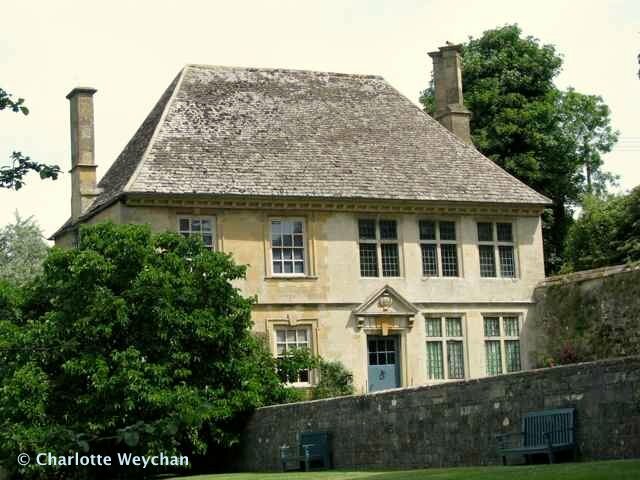 Former home of John Seely, a prominent architect who was also the second Lord Mottistone, it passed into the care of the National Trust (NT) in 1963. 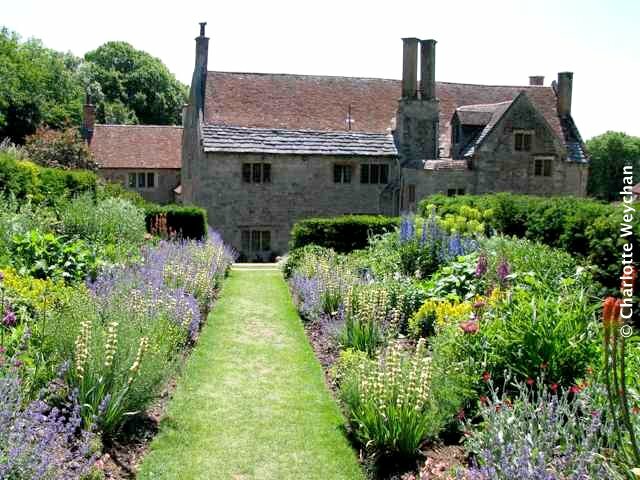 The Manor house is only open one day a year, but the garden is open to the public from March to October. You'll find wonderful stonework here (above) and a chance to soak up the glorious sunshine. As the NT's southernmost "dry" garden, Mottistone has been selected to test which plants will respond best to climate change, and as a result, there's no watering done here. But even though I visited on a very hot day at the end of a long, dry spell, you would never know that the gardens here are not watered because they are quite stunning and the borders (above) are certainly impressive, and you'll find grevilleas, callistemons and proteas here. 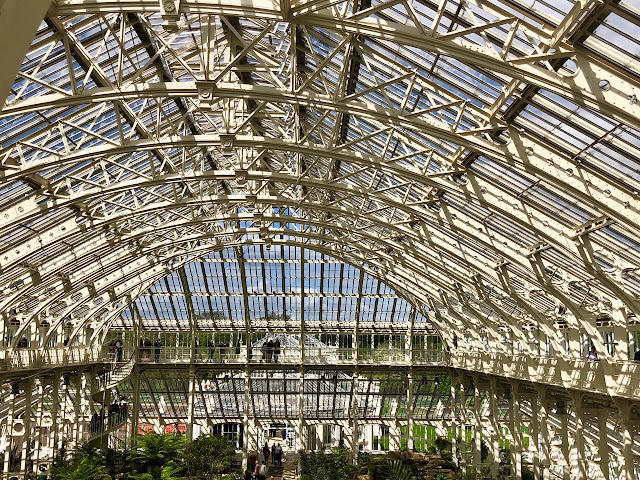 It's not a big garden, but well worth visiting, so combine this with a visit to Ventnor Botanic Garden, and you'll have a wonderful day out. Snowshill Manor in Gloucestershire (above) is a very different property - purchased in 1919 by another architect, Charles Paget Wade who restored the house to its former glory and filled it with musical instruments, theatrical memorabilia, masks, toys and suits of armour and this manor house is open on the same days as the garden. Wade called upon another architect friend, H.M Baillie Scott to help him design the garden, which falls away from the house on a slope. The result is a series of terraced garden areas, linked by stone steps and punctuated with fine stonework, ornaments and glorious views over the rolling Cotswold countryside. The most unusual part of the garden at Snowshill is Well Court, created round an ancient Venetian well-head (above), divided into garden rooms with views over the village and hills behind the property (below), punctuated with striking "Wade Blue" benches and ornaments and painted inscriptions over gateways. 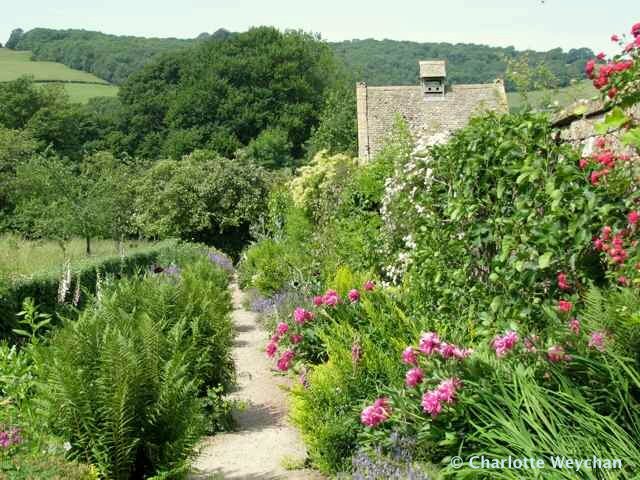 The planting is Arts and Crafts cottage style and everywhere you look there are ebullient and densely planted flower displays that make this property a Cotswold idyll in the summer months. 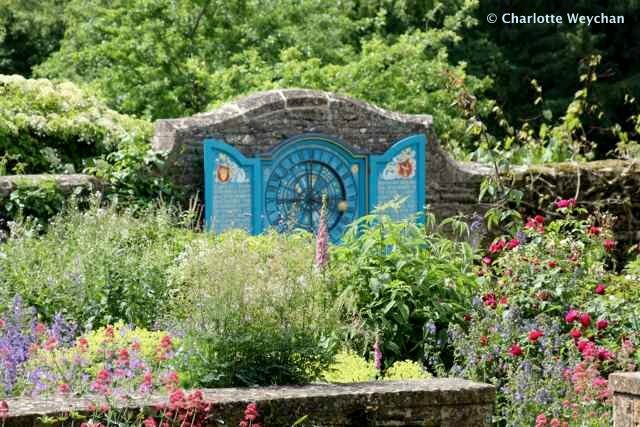 The striking blue colour was created by Charles Wade and once his head gardener (who was actually better versed in stone masonry than gardening skills) had finished building a series of walls and gateways to divide the garden into smaller areas, the same blue was used to paint all seats and woodwork in the garden including the ornamental zodiac clock (below), which must surely be one of the most photographed objects in any Cotswold garden. Given its proximity to so many other fine properties, Snowshill is easy to combine with Hidcote Manor, Kiftsgate Court or Sudeley Castle, but like Hidcote, it gets very crowded in the summer. There's little doubt that this is a truly charming garden and at this time of year you'll see incredible lavender displays on the rolling hills nearby that rival those of Provence. This is rural England at its best but you pay the price for this with the crowds of visitors here, so visit later in the day to avoid the coaches! 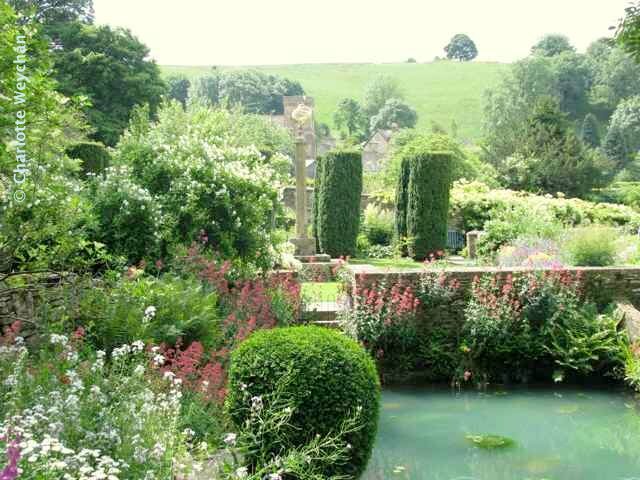 Do check opening times too, because Snowshill is closed on some days that other nearby gardens open! Just love these two gardens ... that top photo shows a stunning garden bed view. Well Court is lovely ... and the Zodiac Clock is a fantastic sight! Thanks for yet again another fabulous garden tour. I wonder how many of us North Americans will understand your title. "To the Manor Born" was one of my favorite britcoms showing on PBS over the years. And the gardens in these manors are gorgeous - as always. Lovely pictures. Will add these to the "to visit" list! Oh my goodness, so beautiful, and I just love the stone walls. How lovely! I'll tell my dad about Mottistone. 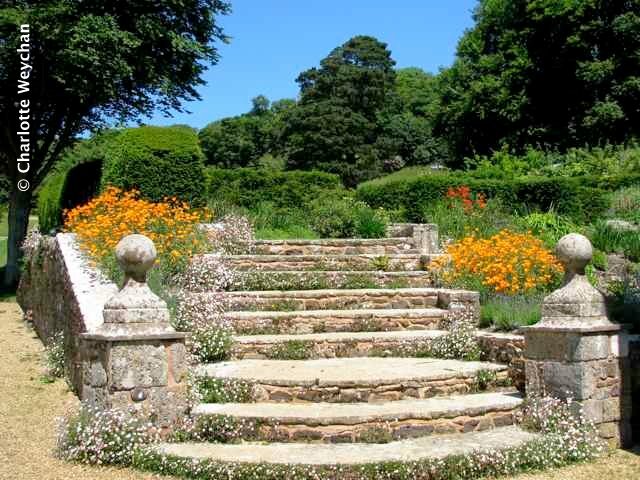 He told over the weekend they are about to have a hosepipe ban in England, because of the hot weather, so he may want to get some planting and design ideas from Mottistone! I found your blog via Dusty Bay's blog hop party. Thanks for taking us on these wonderful tours of some beautiful Enlgish gardens! They're amazing!! mottistone is lovely in May. LOTS AND LOTS OF Bluebells!! Pete pointed me in your direction. I never tire of seeing beautiful gardens. Your pictures are wonderful. Thank you for sharing. Wonderful post. I appreciate it.